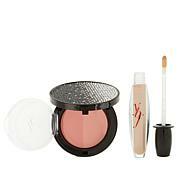 A set featuring a brightening face powder for all skin tones and a bold pink lip color. Ingredients: TALC, MICA, POLYETHYLENE, ETHYLHEXYL PALMITATE, MAGNESIUM MYRISTATE, DIMETHICONE, ZINC STEARATE, BORON NITRIDE, SODIUM DEHYDROACETATE, PARFUM (FRAGRANCE), LECITHIN, PHENOXYETHANOL, CAPRYLYL GLYCOL, TOCOPHERYL ACETATE, GLYCINE SOJA (SOYBEAN) OIL, TOCOPHEROL, LIMONENE, BHT, RETINYL PALMITATE, LINALOOL, HEXYL CINNAMAL, BENZYL SALICYLATE, CITRAL, BUTYLPHENYL METHYLPROPIONAL, CITRONELLOL, EUGENOL. [+/-: CI 15850 (RED 6, RED 7, RED 7 LAKE), CI 15985 (YELLOW 6, YELLOW 6 LAKE), CI 19140 (YELLOW 5, YELLOW 5 LAKE), CI 42090 (BLUE 1 LAKE), CI 45410 (RED 27, RED 27 LAKE, RED 28 LAKE), CI 73360 (RED 30, RED 30 LAKE), CI 77007 (ULTRAMARINES), CI 77163 (BISMUTH OXYCHLORIDE), CI 77288 (CHROMIUM OXIDE GREENS), CI 77289 (CHROMIUM HYDROXIDE GREEN), CI 77491, CI 77492, CI 77499 (IRON OXIDES), CI 77510 (FERRIC FERROCYANIDE, FERRIC AMMONIUM FERROCYANIDE), CI 77742 (MANGANESE VIOLET), CI 77891 (TITANIUM DIOXIDE)]. Ingredients: POLYBUTENE, DIISOSTEARYL MALATE, PENTAERYTHRITYL TETRAETHYLHEXANOATE, SILICA DIMETHYL SILYLATE, BIS-DIGLYCERYL POLYACYLADIPATE-2, PHYTOSTERYL/ISOSTEARYL/CETYL/STEARYL/BEHENYL DIMER DILINOLEATE, POLYGLYCERYL-2 TRIISOSTEARATE, POLYGLYCERYL-2 DIISOSTEARATE, PHENOXYETHANOL, CAPRYLYL GLYCOL, TOCOPHERYL ACETATE, TOCOPHEROL. [+/-: CI 12085 (RED 36, RED 36 LAKE), CI 15850 (RED 6, RED 7, RED 7 LAKE), CI 15985 (YELLOW 6, YELLOW 6 LAKE), CI 19140 (YELLOW 5, YELLOW 5 LAKE), CI 42090 (BLUE 1 LAKE), CI 45380 (RED 21, RED 21 LAKE, RED 22 LAKE), CI 45410 (RED 27, RED 27 LAKE, RED 28 LAKE), CI 73360 (RED 30, RED 30 LAKE), CI 77891 (TITANIUM DIOXIDE), CI 77163 (BISMUTH OXYCHLORIDE), CI 77491, CI 77492, CI 77499 (IRON OXIDES), CI 77742 (MANGANESE VIOLET)]. I didn't care for the lip pop too much as I really don't like gloss too much, but the blush is the perfect shade for spring and going into summer. would recommend for sure. Eyebrows that zing! 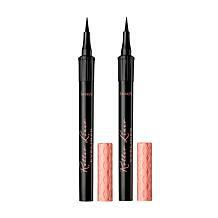 Make your peepers pop with filled-in, on-fleek brows that perfectly frame your face. Tweeze unruly hairs, then shape and style them with the included wax and top off with your shade of powder to set the look. 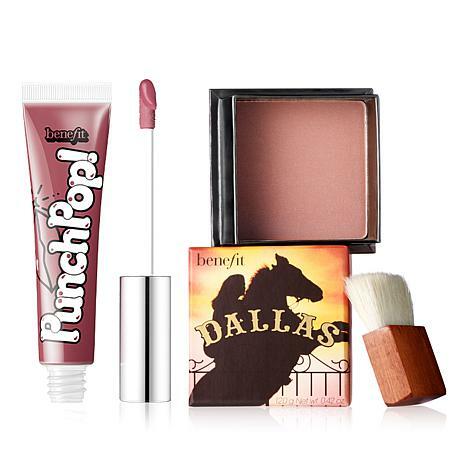 It's a must for every makeup maven's kit! What You Get .06 oz.